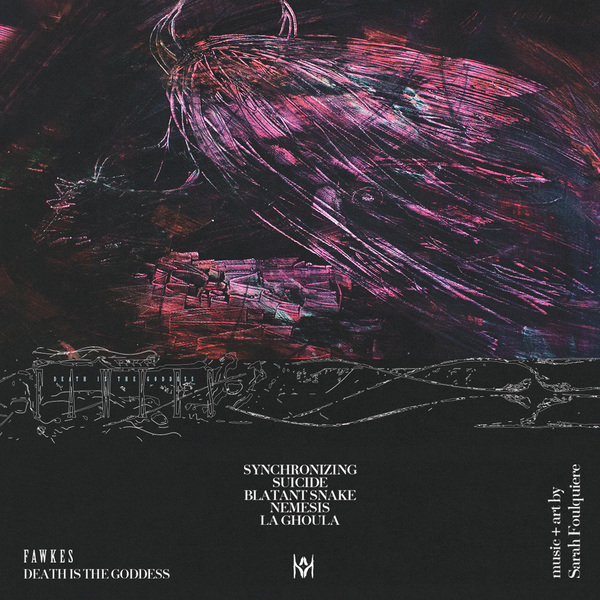 Halcyon Veil render Fawkes’ solo debut mixtape, Death Is The Goddess in its constituent parts of gothic R&B succour and convulsive digital glitch, following from the Paris-based artist’s appearance on the 20 Years of Planet Mu compilation. Across its 16 minutes Sarah Foulquiere aka Fawkes upends her home city’s legacy of electro-acoustic innovation into something resembling an anxiety dream riddled with disparate, fractious nods to Enya’s take on Celtic folk music as much as classic Trance vocals and ‘90s trip hop, all woven into a scrolling tableaux of deconstructed club music memes and operatic chamber gestures. Make no mistake, though; these are songs, rather than collages, following a personal narrative logic from the roiling designs and schizoid vocaloid processing of Synchronising Inner Demon to thru bittersweet harpsichord ripped right out of Portishead’s most avant fantasies in Suicide, before placing her vox sky high over a battlefield of machine gun percussion and recursive digital retches in Blatant Snake, then recalling nastier Arca in Nemesis, and Katie Gately in the strobing chops of La Ghoula.